Moleskine Notes is designed to be used with the Pen+ smart pen, a range of Paper Tablet smart notebooks and Smart Diary/Planner. Together they define the Moleskine+ Smart Writing System. 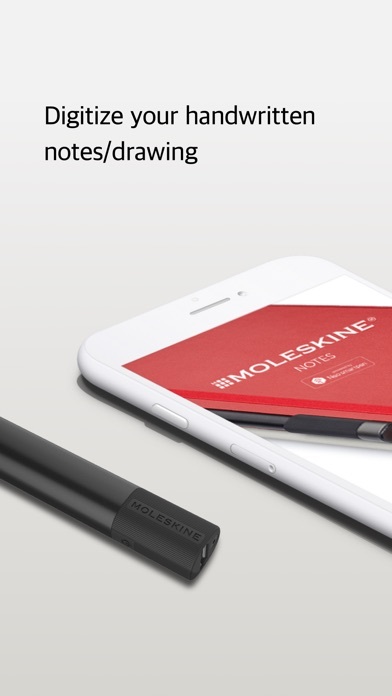 Moleskine presents a new set of tools to write, draw and work with. A specially designed notebook, smartpen (Pen+) and App that work together to instantly digitize notes and sketches made on paper. 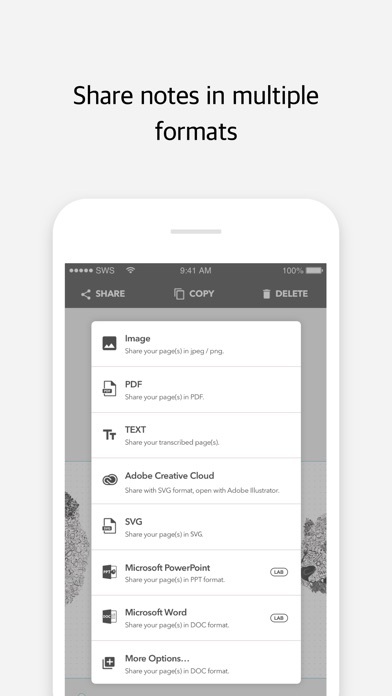 Easily create digital text and images and share them right away with your smartphone or tablet. 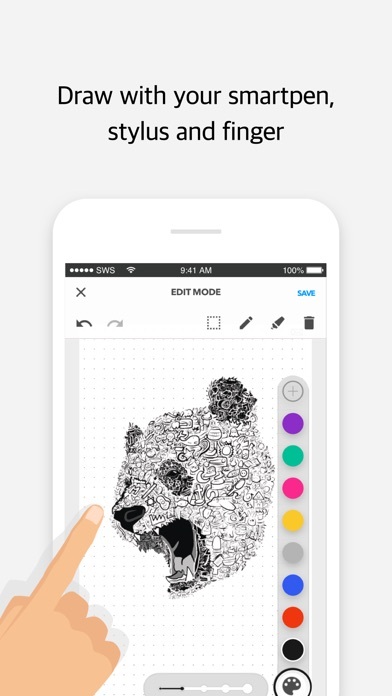 The Moleskine Notes App is the perfect place to keep, find, edit and share your digitized notes. When you use the Pen+ to write or draw on the Paper Tablet your strokes are simultaneously captured and transferred to the App. In the App, use tags keep your ideas organized. Edit your notes using colors to highlight key ideas or correct a mistake. Sync you content or ideas to your Google Drive and Evernote clouds to ensure your thoughts and documents are always connected. You can also pair your handwritten notes with real-time audio recording and replay your synced notes and voice recordings straight from the App. --------- Highlights --------- The Moleskine Notes App is part of the Moleskine Smart Writing Set. The set has the following capabilities: Digital Storage: Moleskine Pen+ is a smartpen that writes on paper but also mirrors into smart devices. The pressure recognition of pen tip is very sensitive. So your handwritten notes and sketches have just as much detail as your physical ones! Transcribe & Search handwritten notes: Your handwritten notes can transcribe into digital text through MyScript’s engine. Once handwritten text is transcribed into digital text, you can export the data, tag content, or search by note pages. Your search results will display notes on the screen. 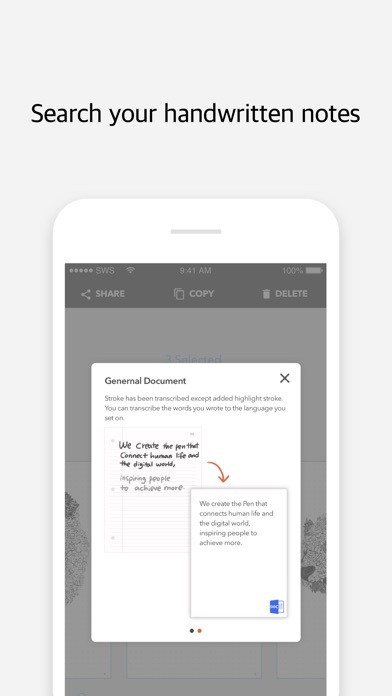 Easy Share: Your handwritten contents can be shared via the app and SNS, and can be sent email by a single pen-action. Record & Playback: Playback the pen stroke data or the audio file that is synced with the strokes. A digital version of your stroke data and audio will be stored in the App and will be accessible anywhere you go. While you record your voice during writing, you can replay your written notes and recorded voice simultaneously according to the timeline. Data reproduction: Your drawing can be exported in a scale-able image format, namely SVG or PNG or JPG, which allows you to reproduce them. Internal Memory: Moleskine Pen+ can store up to 1,000 pages (5 Notebooks) by itself without being connected to smart devices. 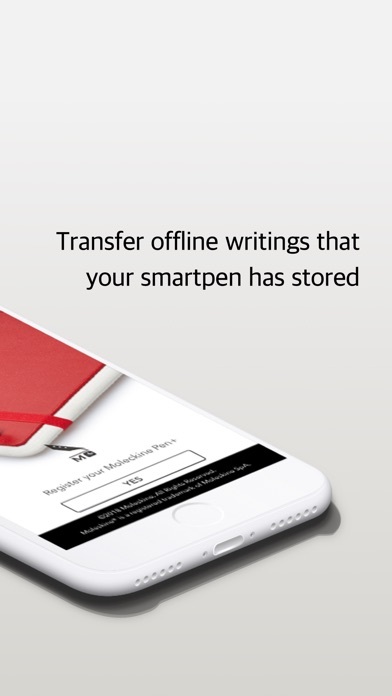 Once you connect Moleskine Pen+ to smart device, the app will automatically archive the notes by date, location and page. *Main updates* 1. Search: Now you can search your handwritten notes based on transcribed text & tags! Don't forget to set your Transcribe Language to enable this magic! 2. More Share formats: Export your note in Microsoft PowerPoint, Word and Onenote. I bought the Moleskine pen three months ago and fell in love. The transcription function on the app worked really well, fulfilling a life long dream to save my handwritten stories in a digital format. I recommended the pen to everyone I knew. I used the pen every single day for work. Then, in March 2019, the company updated the app to version 2.5. The pen still photographs my handwriting perfectly, but the new version of the app is not capable of transcribing my handwriting anymore. I wrote to Moleskine customer service nine times to explain this very specific problem, but they would not help me return to the older version of the app that I loved. The final email from customer service left me in the cold: “we do are not able to see any defect on out app from our side.” I can no longer recommend this app to anyone looking for transcription. I am deeply disappointed after enjoying three months of great work with the app and then losing my favorite writing tool with a single app update. I love moleskine and while I wanted to love the pen, this app needs updated badly. There are so many up and coming note taking apps that I can’t connect to because of the way the app is setup. Even in Evernote, it’s limited. I also tried Adobe Creative Cloud, but the color in the notes is gone. Overall, updating the app for a smoother experience would help. It would be wonderful if I could backup on iCloud and Notes. I have shared this app and smart pen with all of my coworkers and friends. I love that as I write on paper, it uploads my appointments into a digital planner as well as into my iCal. I also love that it uploads in to Evernote and I can access my planner from anywhere. In a perfect world, I would like the pen to be skinnier and more comfortable to hold as well as I wish it is a gel pen. I also wish the planner could be tweaked to include 15 minute increments all day for the schedule and a notes page opposite of the planning page. Otherwise, this is amazing. I just purchased the Pen + Ellipsis and tried to link this app to save written notes to OneNote which is part of my Company’s Office365 subscription. I’ve come to discover that this will only work with personal Microsoft OneNote accounts, which makes it worthless in a business setting (at least for my purposes). I was able to get the windows app to recognize my corporate account but it isn’t compatible with OneNote. I did plenty of research and this was not readily apparent anywhere. I found language well into the support site while trying to troubleshoot. Just got off the phone with Moleskine support to learn that none of this is returnable because the package has been opened. It syncs with Evernote and some others, but they require access to read your notes and the privacy agreement was broad and complex, in addition to the fact that I had to agree to something they did not provide a link to read. Sounds like a scam to mine my notes. The app itself does not do handwriting transcription, so you might as well just take pictures for free of your notebook pages because that’s all you get out of this device. Your notes won’t be searchable, but they will be backed up. This may be worth it for some, but for me I’d rather use my pencil and a plain old notebook and take pictures of very important pages for backup rather than complicate my life with pen charging, etc. What if I lose my pen or leave it at home/work? Additionally, the notebook has pages protruding from the sides to make it appear like a tablet (lame). Without hard cover protection, these will only get destroyed in my backpack and daily life, much as the robust edges of the old style notebook. I’m returning the pen and the notebook. Poor design, poor implementation, lack of features. This seems more like a public beta test to me. Once features to transcribe my handwriting are implemented so I can search my notes, I’ll give it another shot. Though I love the concept, this app needs to synchronize between my iPhone and my iPsd. The pen works great and syncs to the app without a problem. The calendar integration works well. The problem comes when you try to share with any other application. It doesn’t matter if you try as txt, pdf, or graphic the app cannot share to any other application. My reason for trying this app was to take notes that could be shared with my team. No such luck. My third Moleskine book disappeared. When I synched my pen it began to overwrite a previous book, thereby making those pages unreadable. I just got this 2 days ago. I don’t even know where to begin, and how to describe the let down. Want to start off by saying that I never have taken the time to write a review , but this was so disappointing I felt compelled to write something. The app is not very intuitive, it’s hard to get good instruction on what does what , seems to be very little effort on the company’s part to make things clear. My huge complaint is the actual functionality of the whole system. Writing recognition is a total disaster! I bot the smart planner and wether I write in block letters or in script, it doesn’t even come close to being an accurate transcript. I tried everything, read instructions, adjusted angle of the pen, you name it, I did it. Just did not work. There is no sense in it synching right away with Ical, if each and every time, you have to correct the entry! It’s crazy bad. Hopefully I get my money back, if not, chalk it up another failed writing/digital system. I am A huge Moleskine fan, but the smart writing system is a huge fail.